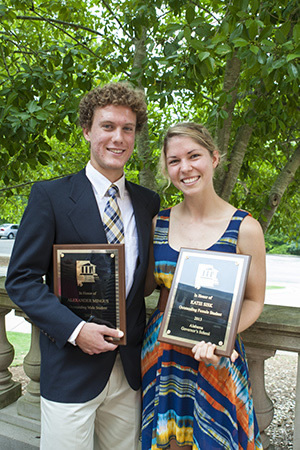 Alexander Mingus of Athens and Katie Sisk of Brownsboro were named outstanding male and female students at this year's Alabama Governor's School. The two-week honors program for rising high school seniors ended Friday, June 28, at Samford University. Mingus and Sisk were chosen by AGS students, faculty and staff on the basis of their participation and overall interest demonstrated during the session. They were among 83 participants from 53 high schools in 29 counties. Mingus, a student at East Limestone High School, is the son of Cynthia and Tim Mingus. Sisk, a student at Pope John Paul II Catholic High School in Huntsville, Ala., is the daughter of Janet and David Sisk. AGS participants received college level experience in academic subjects, creative activities and leadership opportunities.